Type historians have determined that the sans-serif type made its first appearance in the early nineteenth century. This debut occurred in a specimen book from about 1816. It was produced by William Caslon IV, namesake and great-grandson of the most distinguished English typefounder of the eighteenth century. Hardly an instant success, Caslon’s sans design seems to have had little impact on the printing world; but by the 1830s, other foundries’ sans-serif designs began to proliferate. By that time, these direct, dark letters appear to have satisfied the commercial demands of the industrializing West for bold, attention-grabbing letterforms. Although the sans-serif letterform was new to type around 1816, its roots went back further. Type historian James Mosley has traced earlier examples of sans-serif letters by English architects, sculptors, and producers of medals and engravings. Neoclassical advocates like Sir John Soane and John Flaxman appear to have esteemed sans-serif letters for their simple directness which evoked some of the earliest stone inscriptions in the Western world. Such association with the ancient world surfaces in the labels employed to describe the sans type designs once they appeared. Caslon’s initial example was labeled “Two Line English Egyptian” (“Two Line English” referring to the size of the type body). “Egyptian” was a name that Mosley has found applied to signpainters’ work of the era as well. It seems to have carried connotations of both primitiveness and grandeur, and to have been entwined with the then-current “Egyptomania” spurred by Napoleon’s recent campaigns. By the time that sans-serif types gained traction in the market, Caslon’s “Egyptian” label was forgotten, but many of the names that took its place also connected to the long-ago past. One such label is “grotesque,” still used today. For some type traditionalists, who saw the sans-serif as a crassly commercial perversion of the design of letters, “grotesque” may have meant “ugly and deformed,” as it means for us today; but the word “grotesque” originally referred to playful decoration of grottoes in ancient Rome and the revivals thereof among Renaissance artists and Neoclassicists. It seems to me that the purveyors of these fonts would have not intended only the former, disdainful definition, but rather meant to nod towards the latter. Outside of England, other labels prevailed which also evoked the past. In France, nineteenth-century sans-serif types were called “Antiques.” There again we see a more direct, albeit more generalized, connection with the ancient world. The French label, however, also sparks confusion, since outside of France that same “antique” label was used for different types, namely those with thick serifs now usually called “slab-serifs” (which, to the further befuddlement of many, many French foundries called “Egyptiennes”). In America, nineteenth-century sans-serif types were called “Gothics,” a term that again alludes to times long past, but that again spawns confusion, since other fonts resembling the writing of the middle ages also made a claim on the label “Gothic,” and with more prerogative. As for Italian terminology, if the Houghton Library’s specimen book from the Società Nebiolo foundry in Turin is representative, the type nomenclature gets even more confounding. This book, undated but likely published around 1910, includes an uppercase sans-serif typeface it calls “Grottesco.” But what most struck me about the Nebiolo specimen was the name it ascribed others of its sans-serif types: “Etruschi.” This appellation referred to the Etruscans, the archaic civilization that flourished on the Italian peninsula before being assimilated into the ancient Roman world. 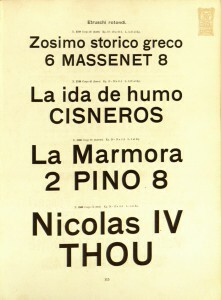 Far from Turin, the “Etruscan” label had already been assigned to other kinds of type designs. 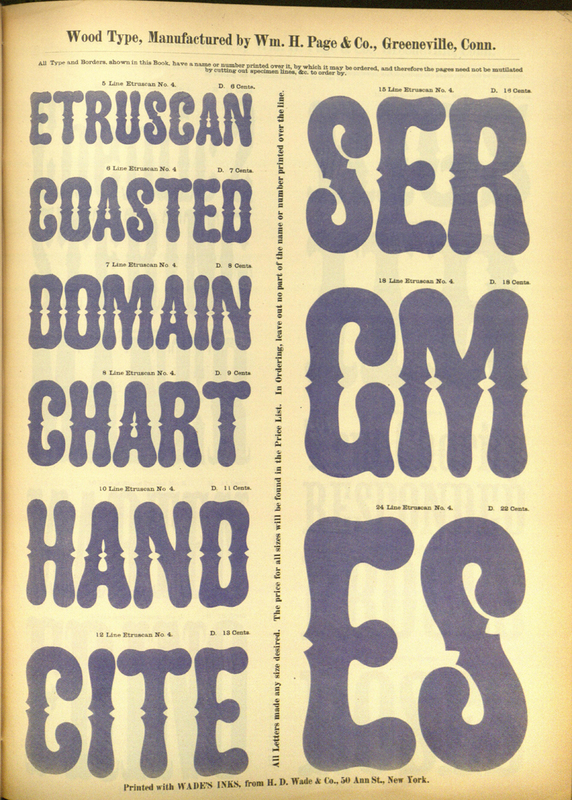 In the rollicking world of nineteenth-century American wood types, which were large decorative types for printing posters and the like, an Etruscan was offered by a couple of firms. William H. Page first showed his “Etruscan No. 4” in 1872. This tall, capitals-only design featured rounded terminals and decorative double pinches on the sides of the letters, granting them the appearance of lathe-turned chair legs. About thirty years prior, London typefoundry Thorowgood & Co. offered a metal capitals-only “Etruscan” type that had hollowed white letters, an illusionistic shadow, and bifurcated stems. 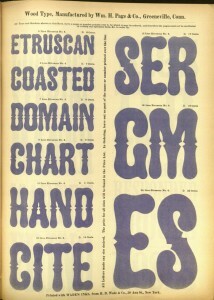 (This last feature, referring to strokes that split at the ends almost like a fish tail, became a characteristic associated with types called by the related term “Tuscan.”) The Page and Thorowgood examples, resembling neither Nebiolo’s sans nor each other, demonstrate that the “Etruscan” label had some appeal throughout the printing world but had no consistent meaning in terms of the form of the letters so named. Such confusion might seem to make the entire enterprise of labeling font designs an exercise in arbitrariness, but it is worth pointing out the fitness of “Etruschi” to the Società Nebiolo type. In tracing the history of sans-serif types, we have marked the debut of the unstressed and unseriffed letter in the early nineteenth-century specimen of William Caslon IV. But this “first” needs to be qualified, for, as Mosley points out, unstressed and unseriffed letters actually appeared in the specimens of his famous great-grandfather in the middle of the eighteenth century. The catch: they appeared not among the ABC’s of the Latin alphabet, but rather among the foreign script types–particularly in the Etruscan alphabet that the first William Caslon cut, based on Etruscan carved inscriptions. Given this precedent in form, once the sans-serif styles of the Latin script appeared, there seems to be a certain justification for calling them “Etruscans” (or, if you are Italian, “Etruschi”). In terms of the characteristics of the letterforms, the nineteenth-century sans-serif certainly has more in common with these Etruscan-alphabet types than it does with historical Egyptian or Gothic writing. And seen from the other direction, these sans types more fittingly deserve the Etruscan label than the exotic, decorated types that were also given it. 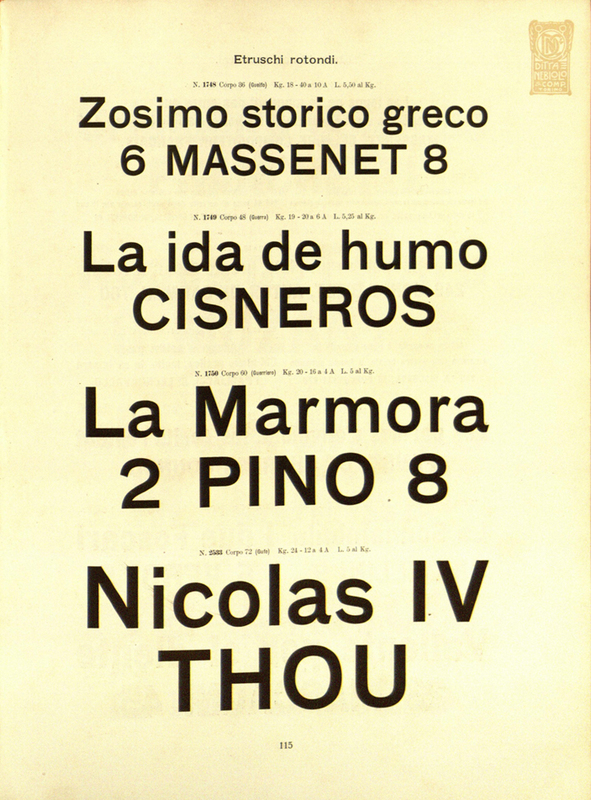 I do not yet know if this Turin catalogue represents a larger nomenclature practice in the type and printing industries of that region of Europe at the time. But I have not noticed any recent references to sans-serif letters as “Etruscan” nor “Etruschi.” It seems that, whatever arguments might be made for the label’s fitness, it did not survive. The Etruschi from the Nebiolo specimen is an exact copy of Schelter & Giesecke’s Grotesk, specifically the Halbfette weight (what we would call Medium). This face first appeared in the late 1890s and was shown in S&G’s specimens at least until 1918.